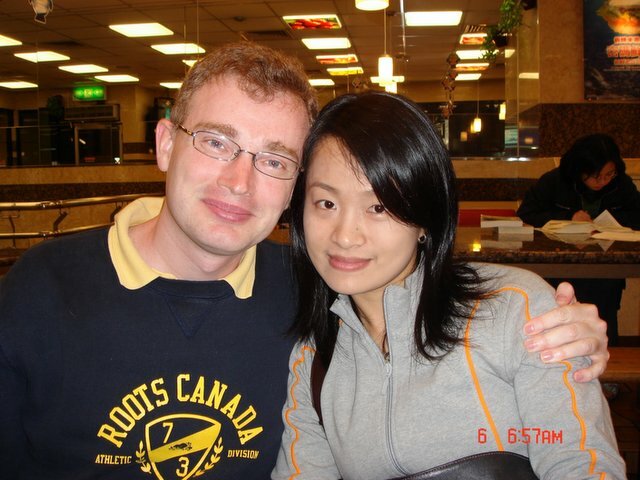 This past weekend, while I was enjoying my 35th birthday celebrations with Connie (sorry, no pictures, I forgot my camera) one of the topics we wandered on to was the question of the value of children in Chinese and North American society. Specifically, we were discussing how certain ethnic group’s parents give them more encouragement to achieve that other groups do, and how that influnces the children. Certainly when I taught Elementary school a few years ago I could see which children had parents driving them forward, and classically enough, it was the Asian and old-world parents who had the kids that were doing the best in school. One of the thoughts that occured to me while were discussing this was why such a difference existed, and one of the ideas that occured to me was the profit motive. In theory, all parents stand to benefit from their children as they age, it’s one of the reasons why people have children, to help take care of them as they get older. However, at least in Asian society there is a custom which I think most Westerners are unaware of, and that is that once they’re working Asian children are expected to hand over a percentage (sometimes a large one if they live at home) of their income to their parents. It’s almost an odd generation pyramid scheme, each generation passing money back to the one before it to help them out. The more successful each generation is, the more successful the parents of that generation become, and in theory even the grandparents. There is a solid profit motive to your kids doing well in school and life, in a direct tangible way here besides “they’ll take care of me”. Not that “they’ll take care of me” isn’t a strong motivator, it is. In the European tradition (and I think most old-world traditions) children are expected to take care of their parents directly, and the profit of the children still translates to the profit of the parents. The parents know, thanks to cultural mores, that the children will be there for them, and so there is a strong reason for them to push those kids to work and succeed in life. While brings me back to North Americans, who, while they do love and often encourage their children at the middle and higher levels of society, still have that whole North American individualism idea. The children are not seen as family assets so much as a hobby, something we do to continue the line and hope that they’ll turn out well. After all, when they reach a certain age, don’t they leave to start their own family? What can we really expect from them in return? Sure, we hope they’ll take care of us in our old age, but there’s nothing forcing them to do so besides perhaps love. (Not a weak movivator, but also not the strongest.) North American parents are taught to “let go” of their children, and see what happens when the children “spread their wings” and “fly (away)”. Is this a strong motivator to produce successful children? One wonders. It gets even worse when you get to the poor and the welfare families in North America, for them Children are less a hobby and even verge on a burden. Sure, they help make bigger welfare checks, or child support money, but most welfare parents seem hardly happy about these lives they have brought into the world. They get almost no encouragement (and even discouragement) when it comes to education, when you think it would be the opposite. You would think that each generation of poor would see their children as their ticket to the future and possible prosperity (this is how people in Taiwan often view them), but instead they seem more interested in neglecting them in favor of beer and TV. Is this because they’re lazy? Or is it the real lack of profit they see in raising children who will just leave them, or maybe be just like them and accomplish little. Then again, they’re almost guaranteeing that those kids will accomplish little by neglecting them. Isn’t it better to bet on the kids and give them a push? I have no conclusion, just questions and ideas. Obviously society has some blame for this too, but how much blame truely goes with the parents? Aren’t they the ones who are supposed to be responsible for raising their kids? What I can say is, a direct profit motive works wonders! 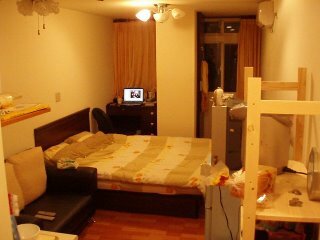 Ever wonder what a cool high-tech Taipei single apartment looks like? Well wonder no longer! Here in all it’s expansive glory is Rob’s 2-shoebox apartment! (As opposed to my former single shoebox apartment!) Behind me is my front door, to my left is my small bathroom and just around the bottom left corner of the picture is my kitchenette! I have a nice simulated wood floor (concrete underneath), a large bed, a desk wedged into the one corner, and a closet hidden within that while column at the back. It’s not bad for one person, and even two can live in it without going crazy. One weird quirk to it that I can’t figure out is that it’s naturally warm when it’s cold outside, and naturally cool when it’s warm outside. There is no reason for this, it just naturally seems to regulate it’s own temperature. I’m not sure if I should be happy or scared, but it’s a nice feature. Now if only I could get rid of the kindergarten in the building next door and their endless singing…. On Thursdays I teach two company executives, Kelvin and Cindy, spending an hour and a half with each of them to improve their English. 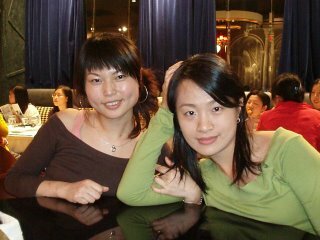 We have a good time, and Cindy and I have come to be pretty close, more like friends than teacher and student. Today when I showed up she looked at me with sad eyes and said “today I have to say goodbye to you”. This was quite a shock considering that there is still 5 more weeks to their contract and last week they both decided to sign on for another 3 months! 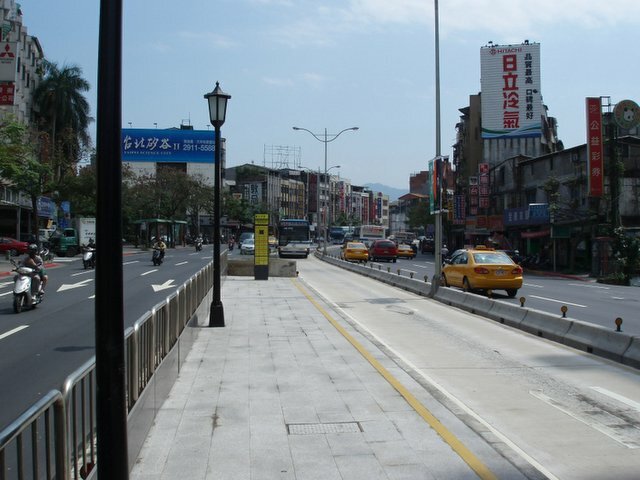 Apparently within the last week a higher position in the city of Kaoshiung (the major city at the South end of Taiwan) suddenly became open, and Cindy was given a chance to take a big jump up the corporate latter if she was willing to relocate within the week. It was a pretty big offer for someone who had only been in the company 7 years, but it showed their faith in her abilities (which are pretty strong) and it probably wasn’t going to come again- so she took it. She has to leave her month-old renovated dream-home behind, and her son (who needs to finish school), but there was no-one (including me) who didn’t think it was the right move. I was actually pretty sad when I heard this news, I didn’t know how much our chats had come to mean to me until today. She’s a very warm and caring person (a former nurse), and has a genuine likeable quality to her that makes people trust and like her. She’s a good person to know, and I will miss her a lot. One of the hazzards of my job is getting to know interesting and cool people and having to say goodbye to them just when they become like family. I’m used to it by now, but now and then someone comes along who reminds me that there is a loss every time I say goodbye to my students. I wish her well, and hope to see her again someday when I visit Kaoshuing! About 2 weeks ago I had my last class with Job (pronounced “Jobe”, as in the character from the Bible), the manager of the brand-new NeiHu Branch store of Far Eastern Geant, a Taiwanese hypermart (supermarket+department store) chain. I’d taught Job for about 4 months, each Friday afternoon from 2-3:30. He was an interesting and somewhat difficult student to teach for 2 reasons: 1) he had great English reading and writing skills after years of reading practice, but almost no speaking or listening skills, and 2) he was less than enthusiastic about our class. (He holds the record of being my only student who when told “this is our last class” lit up like a Christmas tree and said with a big smile “I KNOW!”) His bosses had decided that he needed to improve his English (ironic, since Geant is a FRENCH chain and his bosses speak French) and so forced him to give up his Friday afternoons to practice. Oh, we got along well enough, a little haltingly at first, but it did smooth out over time. He was hard to pick materials for, since everything was either too hard or too easy for him, but eventually we got him balanced out to using more standard materials. Once we could communicate at a decent level, he told me all about his store, his company and his industry here in Taiwan. I actually learned quite a bit from him. He’s actually a specialist of sorts, his company decides where in Taiwan (or China, next) they want to open a store and sends him there. He literally builds up the whole store for the company from nothing using the company resources, runs it for 3-4 years to get it on it’s feet, then hands it over to the next manager and goes off to do the whole process again. He loves it though, considering it a challenge and tries to make each store better than the last. I have to say he’s a bit of an organizational genius, and it was amazing how much he knew about everything in that store, it really was his baby. I might not miss teaching him, but I do think I learned quite a bit from him. Good luck in the future, Job! But, what I didn’t know is that apparently after the war Vietnam had a serious population imbalance because many of the men were dead or injured. The result being that women had to take on most of the important jobs, from raising families to running businesses. Now, going forward thirty years, apparently Vietnam is a virtual matriarchy! (A society run by women.) He told me that for example at his company’s branch office 80% of the sales staff are women, mostly because they couldn’t find men qualified to do the job! Women in Vietnam, he told me, are confident and well educated, while men tend to lack motivation and aim for lower and middle level jobs. I found this interesting because I can see this happening in Taipei too, and I suspect similar things are happening across Asia. Asian societies are becoming increasingly dominated by aggressive and capable women, while the men muddle about unsure of what to do. Then again, maybe the same thing is happening in North America, I have seen a definite shift in our own society by women taking increasingly higher paid and higher educated positions while men are slowly dropping out of the race. In North America, I blamed a lot of it on the whole cultural push that was about empowering girls, but left boys in the dust (because they didn’t need empowering, right?) to fend for themselves. But, seeing this happening here in other countries which don’t have a “girl power” culture, I have to wonder what else might be going on. Why are men falling behind and women moving ahead in some societies? What’s keeping them from racing neck and neck like it should be? The other interesting thing he told me was that Vietnam doesn’t allow foreign trading companies to operate in their country. They are more than happy to support factories (they get tax free status for 5+ years) but aren’t interested in businesses which might take money out of the country. (As it should be, I think.) 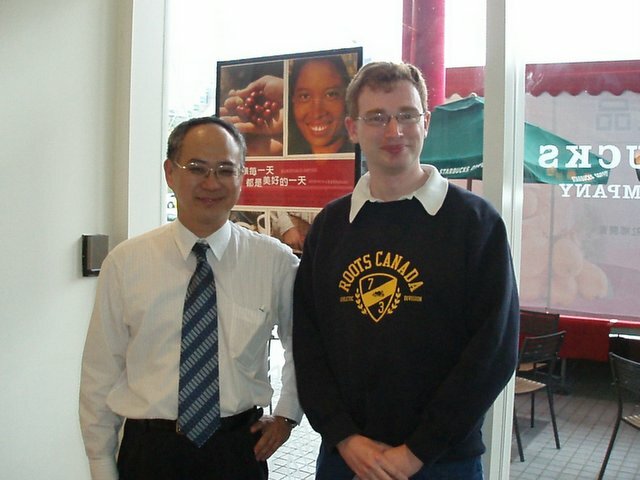 Oh, and he also told me that he was pleasantly surprised by how un-corrupt the Vietnamese he dealt with were. He’s dealt with people in many Asian countries, but he said he was surprised they didn’t want any bribe money to do things there, which is normal in most of Southeast asia. So, having finally caught up on all my picture posting, I thought I’d mentioned a little bit about my current situation in Taiwan. Today I renewed my Alien Resident Card, which means I’m good for another year. I have a great new apartment (which I’m slowly discovering is more noisy than expected, but I can deal with it) and in general life is pretty good. I’ve gotten back into my old routines and am even working out again. Right now I am teaching 5 corporate classes and they’re all going pretty well, but I do have a lot of extra time at the moment so I hope I can get more classes soon. (My new apartment is more expensive than my old one, so I’d like 7 classes or more, optimally.) I’m also teaching a new session of the ShiLin Writing Class I posted pictures of from before I left for Canada, several of my old students came back (David, Jenny, Vivian and Elaine) and a bunch of really interesing new ones joined, so we’re having a really good time studying writing. Actually, the week before last a new student joined that class whose name I won’t mention, but his first question to me was “Can I go take a piss?” Which surprised me a lot, both with how good and natural his English was, and how he knew such vulgar slang. I tried to let him know that such language wasn’t appreciated in this class and hoped he wouldn’t be a problem. Luckily he dropped out the next week, his mother said my class had “too much grammar practice” for him. Funny that, a writing class with grammar practice. Who would have believed it! The weekend before last, Connie and I had dinner on Sunday night with Connie’s best friend in the whole world, Anita! 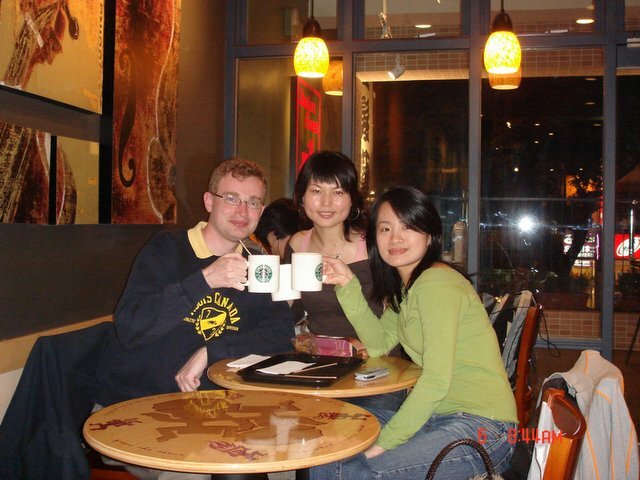 Anita has recently returned from 6 months of studying English at a school in England, where she had many romantic adventures that included her becoming the star of the show for a Korean male fashion model who was also studying there. Anita shared with us her adventures, and her plans to return to England shortly where her lover awaits her visit for another month. Anita is a silly and cheerful girl, the kind who lives at her own pace and has her own unique style, not unlike Connie. No wonder they’re best friends. Rob and Connie : Happy Couple 26, the Revenge! You know, I think Connie and I are getting really good at these couple shots. Of course it helps that Connie is getting more beautiful with age. Loveya babe! Rob, Anita and Connie raise a glass to corporate capitalism and Anita’s coming return to England to love and conquer! Good luck Ani! We’re cheering for you!